The old saying goes, “if you want something done right, you have to do it yourself.” But when you have a whole group of students who feel the same way, you have the makings of a powerful and influential leadership team. Led by this year’s student President Fallon Gross of Flemington, NJ (RU ’09), Chabad’s Leadership Team is proud to announce the dates of the annual Rutgers Mitzvah Marathon – a week long marathon of goodness and kindness, on and off campus. Involving over 400 student volunteers, this effort brings hot food and joy to homebound seniors and shut-ins, toys and funds for hospitalized children, sandwiches and clothes to homeless people, blood donations for our area’s blood banks, Jewish programming for special needs young adults, as well as the opportunity to do a mitzvah with fellow students on campus. Beginning on April 6 and continuing through April 13, student leadership volunteers will be running Mitzvah Marathon Tables throughout Rutgers’ 5 campuses in New Brunswick and Piscataway. Student will offer passersby a wide variety of mitzvah opportunities including a Tzedokah Box for Children Victims of Terror in Israel and Magan Dovid Adom, free Shabbat Candles for college women, the putting on Tefillin for the college men, saying the Shema Yisrael, sponsoring a letter in the new Sefer Torah being written for Peace in Israel, packing Passover gifts and Seders-to-Go for Jewish US Army and Air Force Soldiers stationed overseas, plus many others. 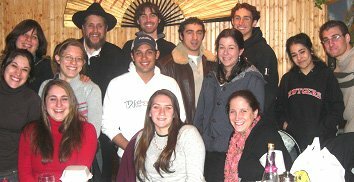 Mitzvah Marathon Director, Erica Santiago from New Winsor, NY (RU ’08), added that “we are looking for people to give an hour out of their week to make the difference in someone else’s life – and you can’t imagine what a difference it makes. To give an hour, respond to the facebook event, or email us at chabad@rci.rutgers.edu. For more information, please call Mitzvah Marathon Headquarters at 732 296-1800.